I know beaches are for summertime, when you can score that tan RIGHT? Truth is I despise sitting indoors, so every year mid winter I plan a trip for my family to the SOUTH! When we sat down this past month and discussed our favorite vacations, our trip to Gulf Shores was ONE of my favorite (I have so many favorites). I have always dreamed that I could be a southern girl; I know I do live in SOUTHEAST Missouri, but the Deep South is such a rich environment of arts, culture, history, and SOUTHERN HOSPITALITY. My dear Ryan declares his favorite thing about the south is their SWEET tea, that I still hold as true northern…unsweet all the way! I can spill you a list of reasons of why you should visit Gulf Shores Alabama as a family, but why in February. Besides sneaking away to avoid the snow, bragging to all your friends about how warm it is, my main excuse is the SAVING MONEY on vacation in off-season. First glance at the visitors guide for Gulf Shores, Alabama and you might feel a bit overwhelmed. There is SO MUCH to do and so little time. Here are a few places that my adorable sidekicks more than fell in love with. Named” The Little Zoo That Could” sure did win us over! We are frequent visitors to the St Louis Zoo, but never have I seen a zoo like this. The Alabama Gulf Coast Zoo has the charm of visiting the organic farm down the street, but the spectacular animals that you see in your much larger zoos. How this zoo charmed me is I loved that we felt so up close and personal to the animals. We could not touch the animals, but they were only feet away instead of hidden away behind large caves, behind big rocks, and glass walls. In 2012, The Alabama Gulf Coast Zoo will be in its new, larger facility, but promises to retain the small park feeling for their guest. For Admission Prices and Hours, please visit The AlabamaGulf Coast Zoo. Dine Gulf Shores Alabama Style! Are you ready to dance, laugh, laugh at other people, and eat some good food….if that DON’T appeal to you then you’re missing the fun! Probably the only thing my kids (or at least Celesse) can remember from The Hangout is watching the 82 year old grandma do the Chicken Dance on top of the dinner table…it was her birthday! We danced, we laughed, we dined, and we made memories at The Hangout! Normally we give places our 2-thumbs up seal of approval, but this trip was prior to our trademark, however, I give them our 2-thumbs up and then some! Visit The Hangout to see their complete menu, hours, and upcoming entertainment. Photographers dream, a little boy’s fantasy, and room to run all in one place. Historic Fort Morgan, completed 1834, active during the Civil War, Spanish-American War, World War I, and World War II this place is full of history. While history will be the draw for most, Fort Morgan can be more than just a history lesson. In a moments time you can turn this place into full adventure. Watch the boats just off the coast, climb the many stairs to find all the hideouts, see the Jellyfish laying on the shore, and giggle while you forget about your worries. Visit Fort Morgan Guardian on the Bay to plan your visit to the fort. Disney watch out these Dolphins have got something on you. Now maybe I can’t really compare dolphins to Disney, but these beautiful creatures will capture your little ones imagination. Dolphins are natural born surfers, go figure they live in the ocean, and while you are admiring their show, they are really just catching some waves. Dolphin Cruises are available by various charted boats, to select the one that fits your needs visit the Gulf Shores Visitors Page and search dolphin cruise. Now here is the deal, have you ever heard of a “snowbird” well there is TONS of “snowbird” specials, they even hang welcome signs for all the snowbirds. Moms, Dads, or anyone wanting to steal a deal visiting the beach during “snowbird” season will save you some MAJOR MOOLAH! Condominiums are for rent for nearly half the price, beachfront hotels can be booked for a great bargain and many of the places run promotions including gas cards or meals. Visit GulfShores and Orange Beaches CVB website to see some of the winter bargains, but also check with your favorite hotel chain you will gasp at the winter prices. 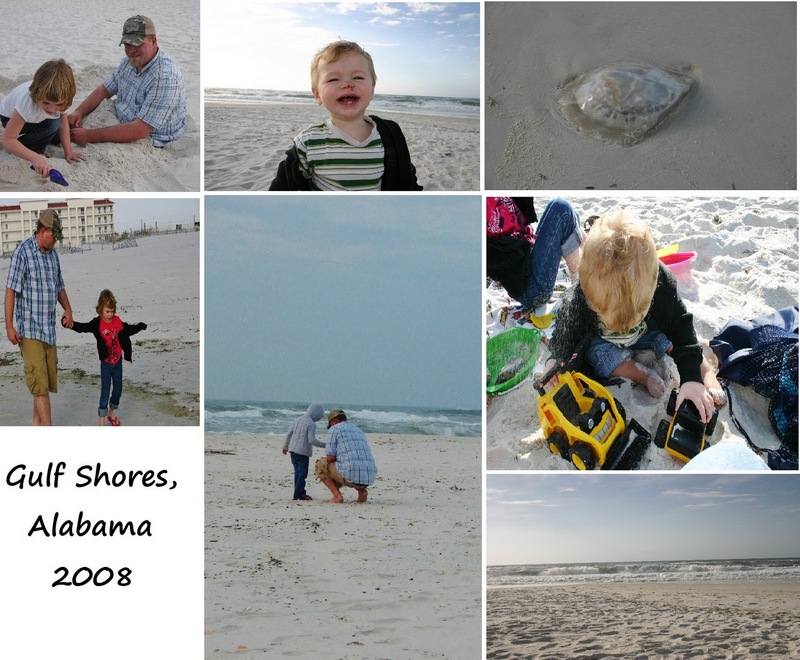 I have only listed a few short things to do in Gulf Shores Alabama, because if you are like me you will find yourself planted on the beach with Tonka trucks and sand buckets for hours of giggles. We found the beach not only beautiful, but also quite comical. Young Dillard was just fourteen months on our vacation there; the sounds of waves crashing on the shore would put him to sleep just moments after we hit the beach. He spent much of his beach time draped across my lap snoring up the afternoon.